Professional Hard Floor Cleaning in Westminster. Ask our non-stop customer care operators for a totally free price quote right away. Just call 020 3746 0000, or send us an online request now! All of our Westminster W cleaners are equipped and qualified to remove the old polish or other sealant from your hard floor before cleaning it and applying a new one. The cleaning professionals use the most up-to-date machines to evenly and effectively remove the polish without damaging the floor. The new polish is applied after the deep cleaning has been done. Again, a special speed rotary machine is used so that the polish is evenly applied. If your floor is form natural stone, a special water based impregnator will be applied in order to repel any spills and protect the floor from getting stained. Every solution and sealant we use is tested, Prochem certified and perfectly safe for you, pets and your children. Rejuvenate your hard floor outdoors and indoors - book our cleaning service right now! The cleaner or team of cleaners arrive in Westminster W at the time booked by you with all the cleaning tools, solutions and machines necessary. A thorough assessment of the condition and type of the floor is done. Any furniture will be removed, but of course a lot of time will be saved if you have removed it beforehand. The floor is hoovered so any residues are removed before the cleaning. The chosen cleaning solution is tested on a hidden and small spot to watch for possible negative reaction. If everything is alright with the tested area, the cleaner proceeds to spray or apply the solution. 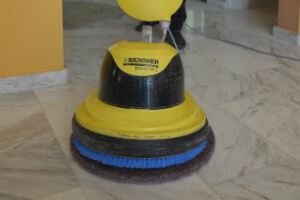 Depending on the type of floor it can be scrubbed in or just applied with drive pads (for wooden floors). The floor is then rinsed with clean water and then dried. After that, if it is necessary, the cleaner will apply the protective layer, which depending on the type of floor can be: wax, polish or sealant. We at Thomsons Cleaning pride ourselves with the high quality and reliability of our professional maintenance and cleaning services which we provide to our domestic and commercial customers in Westminster W. Customer satisfaction is our top priority, which is why we insist on hiring only the best cleaners, training them thoroughly and equipping them with the leading technologies and solutions in the cleaning business. Hard floor cleaning is no exception. Our experienced cleaners can professionally and safely clean all kinds of hard floors, including: wood, vinyl, natural stone, concrete, terracotta, tiles, marble, limestone, granite, slate, etc. Our company also offer professional floor sealing and polishing, as well as hard floor maintenance services. In order to book our hard floor cleaning service in Westminster W, just dial 020 3746 0000 or send us an online booking request. The customer care operators are at your service 24 hours, so your request will be processed as quickly as possible. Within two hours of the request, you will receive a written confirmation via e-mail and SMS. Without any deposit. The price for the cleaning service is fixed without any hidden taxes. You will receive a sizable discount if you book more than one of our services simultaneously though. If you book early or are a regular customer, you will receive preferential prices. Same day booking is available. Booking for any of the 365 days of the year is possible too. Book now!